In early May, we did a scheduled medication change with Nathan. He had a bad reaction to it. Within three days he started hallucinating and not eating or drinking. Jay started sleeping with Nathan as he kept getting up in the middle of the night and wandering around the house. As a precaution, we took him to the emergency room to be evaluated. 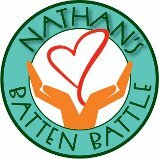 As it turns out the nurse had a childhood friend who has two boys with Batten disease. They needed to give him an IV which resulted in him having 5 nurses hold him down. They finally gave him a dose of Versed through his nose. They were able to get his IV in, but he was still highly agitated. They gave him another half dose through his IV. Finally after 36 hours of being awake, he fell asleep for 2 hours. They gave him a bag of fluids and his Depakote since he had not had any of his daily meds. They did his blood work, all which came back within normal range. He slept and we went home. The hallucinations continued, they never seemed to be scary to Nathan. He started to seem a little better. We were having to block him in his room at night to prevent him from walking around the house, but that stopped working. We thought he was finally getting better, enough for us to feel comfortable leaving town for a couple of days for our anniversary. Unfortunately, when we returned the hallucinations seemed to be back and worse than ever. They are now scaring him and he cannot seem to settle. It is constant for him and I literally have no clue what to do. I am so scared this is progression of the disease. I do not want this to be our new normal. I just want my little boy back. Our nursing coverage for the month of June will be difficult with my job as well. Please just say a prayer that we get Nathan back to himself. Love & Hugs to you all! Such a difficult journey! Prayers going up! Nathan is an amazing kid and I truly love him and this family. Stacey and Jay, you are amazing parents; ALWAYS believe it! I pray for you all daily and you’re always in my thoughts. Love you and we will be here for you every step of the way.